Written by: Gary Michor (CEO) & Greg Doucette (CFO), Screaming Power Inc. The world is changing around us and the speed of change will only intensify. Global Warming, Green House Gas (GHG) emissions, the Internet of Things (IoTs), digital infrastructure transformation and Government policy is effecting us all. Leveraging mobility to manage business change will greatly assist everyone involved in energy and building management across the globe – especially for utilities and large enterprises. For the first time ever, the energy sector will be required to manage the electronic information needs of the customer, global markets and our global economy. Regional Governments are demanding Utilities to provide access to information and engage in innovative technologies. Regulations are adapting to manage GHG emissions for private and public entities. There will be a cost to those who don’t adapt their business processes. We know 35% of GHGs is produced by buildings. There is a global evolution to reduce this. Today we are being incentivized to conserve and embrace Green Energy. Tomorrow we will be forced to change. People around the world will need to work together to rapidly learn and educate each other to meet the global changes that are affecting us all. It’s not about a single disruptive technology. It’s about managing the changing information landscape from business as usual. It’s about dealing with a world which has finally concluded that understanding and managing energy data along with building information is critical. Change in the energy industry is accelerating. The latest research points out that 90% of utilities expect technical advances to significantly change the industry over the next 3yrs leading to a digital infrastructure transformation. Utilities worldwide will spend 87.5 Billion on IoT products/services by 2018. While integration of multiple systems, technologies and devices will be required, we need to look at innovative, automated ways to connect and share information with the masses. Using Mobility to Enable Digital Information Access to the World is the Only Viable Option. The beast has awoken and we now have a globally need to change businesses. Screaming Power has the energy expertise and mobile / cloud infrastructure to rapidly meet the needs of utilities and global energy users. All building owners / occupants to meet government / market demands while allowing the IoTs to evolve. Our platform solves the issue of building and energy management for all building types. 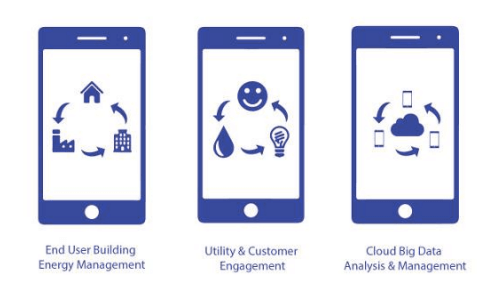 We meet market needs by providing cost effective mobile solutions for information that not only enables energy management but allows users to socialize change. Our ‘Scream Utility’ mobile service provides Utilities with cost-effective, speedy implementation for true customer engagement. The Utility-branded solution can make use of a number of optional features, with or without access to the Utility’s own infrastructure. The service is suited for both small & large Utilities. Services are designed through a templated list of features that the Utility chooses from to suit their needs today and in the future. Branded Solution – Engages Customer and solidifies market branding of Utility. Bill Delivery with Payment – Automatically delivers energy bill & all electronic data associated with the bill to the customer. For the Utility: Saves money. Speeds up delivery & payments. Replaces paper & pdf delivery. Automates payment reminders. For the Customers: Allows easy data management. Replaces manual data entry: eliminating errors, costs and bill payment bottleneck. Data can be easily shared & reused for the IoTs. Automated Customer Issue Management – Customer-centric engagement for system issues and outages. Allows customer to assist the Utility in system management. Provides 2-way communications through the app. Social Engagement – Integrates / presents social media (e.g., Twitter). Can provide news on Utility and/or energy market. Integrates to existing social media platforms. Provides a superior customer interface focused on your (ad hoc or regular) communications. Meter Data Delivery – Automatically delivers meter data to the customer through the app. Provides electronic data to the customer seamlessly (no portal login) and securely. Allows for multiple standards, including Green Button. Conservation Engagement – Automates the application process and conservation program management. Provides coupons, energy audit integration, marketing, & education directly in the app. For Utility: Manages conservation program centrally. Reduces paper, admin and marketing costs. Tracks results easier. For the Customers: Simplifies access to all utility information – one place, one app. Personalized Communications – Ability to communicate directly with the customer and integrate with other App features. Integrates to the Customers’ mobile device via the App allowing 2- way communications. Customer Presentment – Presents location, historical billing and meter information through maps, reports and graphs. Provides all Utility-related info and communications in one location. Integrates “siloed” utility systems into one customer mobile interface. Multi-Utility Coordination – Able to use the same infrastructure with other Utilities to share costs. Integrates with ‘Scream Energy’ End User App at no added cost. For the Utility: Reduces development costs and assists in cooperation with other utilities. For the Customers: Works seamlessly by integrating with multiple Utilities. Utilities have historically had regulatory barriers & jurisdictional boarders to protect its customer base. This is changing due to external events that can no longer be controlled. IDC Energy Insights predicts by 2018, 20% of energy consumers will buy new energy related products/services from Utilities/affiliates, opening up new revenue streams. Utilities must find new ways to engage their customers. We can integrate &transform a utility to the digital era with minimal effect on their existing IT infrastructure. Screaming has invested 3+ years in understanding the Utility market’s IT future. IDC’s 2016 survey of Utilities predicts about 40% of the industry’s revenue in 2020 is expected to come from new business models/services. Our 20+ years’ experience building data standards and energy market infrastructures isn’t enough to understand what the future will bring. We focused on mobile / cloud technology after listening to our Utility and end-user advisors on what they believe the future will bring. The ‘Scream Enterprise’ mobile service provides quick implementation and cost effective access to corporate building and energy information. The solution provides a mobility platform for corporate sustainability and education related to energy conservation. The fully “brand-able” solution can be implemented with a number of optional features … with or without access to the enterprise infrastructure. The solution is suited for large and small companies alike and provides services that enable templated features which your company can choose from now and in the future. Branded Solution – Engages employees and solidifies brand. Bill Information Management – Option to manually enter Bill info by multiple users or have us do it for you. Option to automatically deliver bill info. Simplifies energy data entry across the enterprise. Integrates easily to new Utility data management methods. Provides easy data management. Reduces admin time. Standardizes data across Utilities & integrates easily with the IoTs. Mobile Dashboarding – Provides a simple to use mobile dashboard to keep organizations up to date on energy usage and conservation activities. Provides Corporate reporting on energy usage and GHG consumption. Social Engagement – Integrates / presents social media (e.g. Twitter). Provides an Integrated Blog in the app. Links to existing social media. Provides a superior user interface focused on your communications. Meter / Billing / Building Data Management – Mobilizes data from multiple sources (Internal/ Utility / third parties). Standardizes across multiple datasets. Provides information to the app user seamlessly and securely. Supports multiple standards, including Green Button. Employee Engagement – Provides conservation information, education & building comparisons. Ability to automate processes. Manages engagement centrally. Uses GHG and Weather Normalization tools to socialize. Reduces paper and employee engagement program costs. Personalized Communications – Ability to communicate one-to-one with the app user. Provides user-centric engagement. Integrates to the users’ mobile device and provides auditable, two-way communications via the App. User Presentment – Provides location, property details, billing and meter information through maps, reports and graphs. Offers info and communications in one location. Integrates “siloed” systems into one mobile tool. Multi-User Coordination – Enhances sharing of info. Integrates with Scream Energy App at no cost. Can selectively share info with others outside the organization. Works seamlessly with multiple Utilities / Systems / Users. Assists in coordination and cooperation for building / energy management. Businesses with a corporate sustainable mission are the leaders of change. Many of them have been spending years collecting information in an unfriendly data collection environment in the energy industry. To understand what they have been through, Screaming has brought in subject matter specialists from private & public organizations as well as Associations, institutions of learning and individual policy specialists to better understand the needs of this market segment. It has been an interesting journey and Screaming has learned so much. The fact is, all organizations that Screaming has talked to have the same issues with access and management of their data. They all spend most of their time dealing with data issues. This is where Screaming has the expertise, IP and knowledge to make positive change. Our mobility platform, knowledge of standards and ingenuity will allow the easy flow of information and connection to the IoT. Screaming has been looking at the world market overall and investigating the billing / metering / building standardization issues with electric, water and natural gas. This has opened our eyes and challenged us to find solutions to help in a cost-effective, cooperative manner. We have created an improved and easier way to compare building, energy and GHG emissions. This has lead us into detailed discussions with policy makers and government entities to make life easier for all. Scream Enterprise provides the “glue” to enable an open Energy Ecosystem. Weather Normalization (WN) will help socialize energy conservation and stimulate change. WN is a way to standardize your building information so you can compare your energy usage or GHG emissions with other buildings. If you want an “apple to apple” comparison between buildings, you need to remove the outside weather conditions. New WN algorithm to be released this year. Working within a pioneering marketplace requires flexibility and foresight. The energy industry is facing rapid change caused by destructive environmental and increasing technological progress worldwide. Connecting sustainability with building energy usage and greenhouse gases is a new requirement the world is embracing. Business processes have to rapidly adapt to meet the new demands of the marketplace. Today mobile technologies are under-utilized by utilities and property owners. Building and energy information is not freely flowing electronically. This is about how to quickly change due to global policies and the need for business efficiencies to be improve upon. Effective energy use / employee engagement is the cornerstone in achieving government and corporate goals to adapt to this disruptive landscape. Management at Screaming Power have succeeded in building strong businesses in the pioneering energy data marketplace before. We are not only experts in energy data collection and management, but we also have spent over 3 years in creating a templated mobile solution. Our IP landscape allows us to quickly and cost-effectively assist our clients in achieving their sustainable business goals using technologies that will evolve over time. We are creating a technology roadmap that allows us all to work together to create change. Our solution set is built so existing and future features can be used by our client base overall. In essence, we have created a cooperative process, where new ideas can quickly turn into concepts. These concepts get developed into real prototypes that get tested and put quickly into the app. From there, we implement the feature into multiple client instances to achieve their goals. This saves everyone time and money and allows us all to evolve more quickly and cost effectively. Work with us to make seamless change happen. We can integrate data with new technologies so we can all engage, learn and evolve together. We look to innovate and engage without you having to manage the evolution of the mobility learning curve. You have enough to worry about. Be part of a community that works together to manage innovation and disruptive change. Be part of a solution that will grow with your needs. Take part in evolving technologies that open opportunities for the IoTs.